Bonjour à tous! When we come to Germany, it is definitely for family time, so we don't tend to travel much within Europe, unless it's for daytrips within Germany (e.g. Rüdesheim am Rhein; Strasbourg) or short getaways with the family (e.g. Amsterdam last week). And speaking of family time, check out the #schatzisindeutschland hashtag on Instagram to see all the wonderful German home cooking we've been enjoying whilst here! 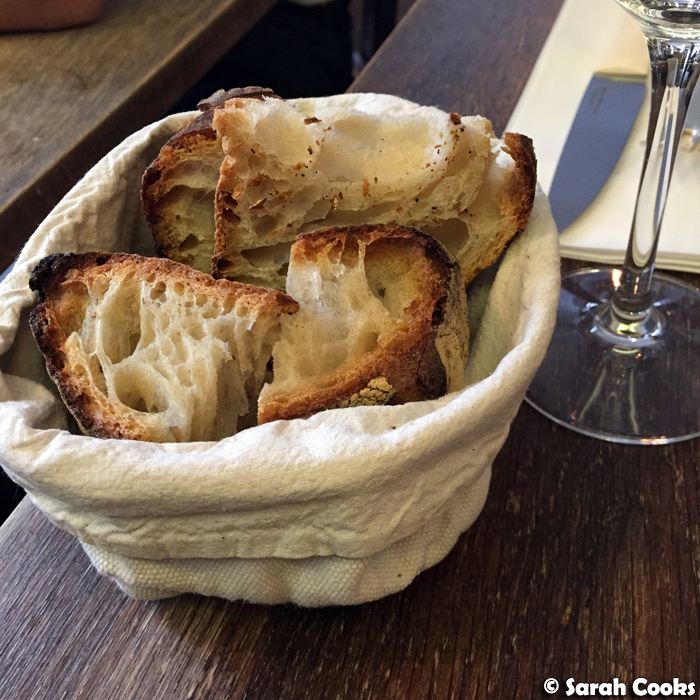 However, I did manage to squeeze in a short two-night trip to Paris earlier this week, to catch up with my friend Clarice, a fellow foodie and all-around lovely person, who has called Paris home for the last eight years. 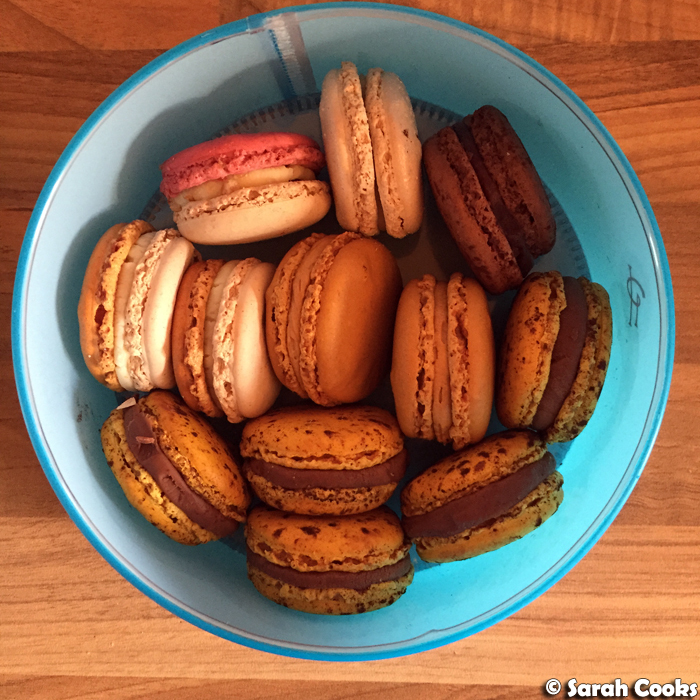 (Kinda like Rachel Khoo, but infinitely more awesome!) Prior to the trip, we were emailing back and forth to plan out all our meals and created a pretty ambitious itinerary. Looking back over the photos, I cannot believe how much we managed to eat in such a short span of time! Let's take a look! 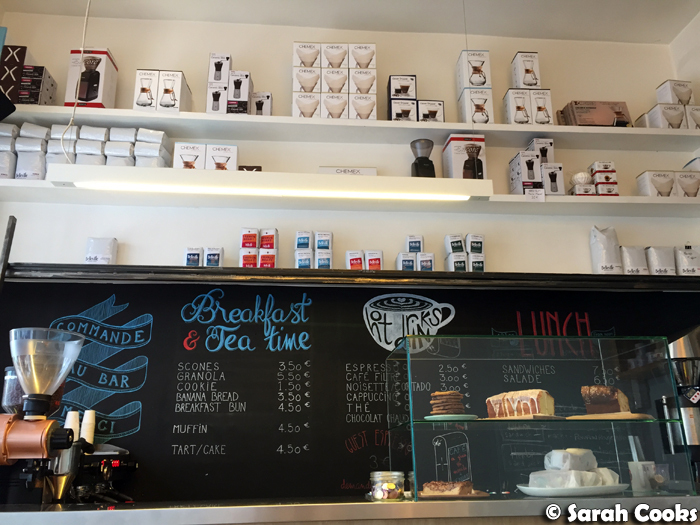 So, my train arrived in Paris around one o'clock on a Monday afternoon, and I had a few hours to spare until I was due to meet Clarice, so I'd prepared myself a little walking tour of Aussie-style coffee shops, to keep me busy (and well caffeinated!) until it was time to meet up. 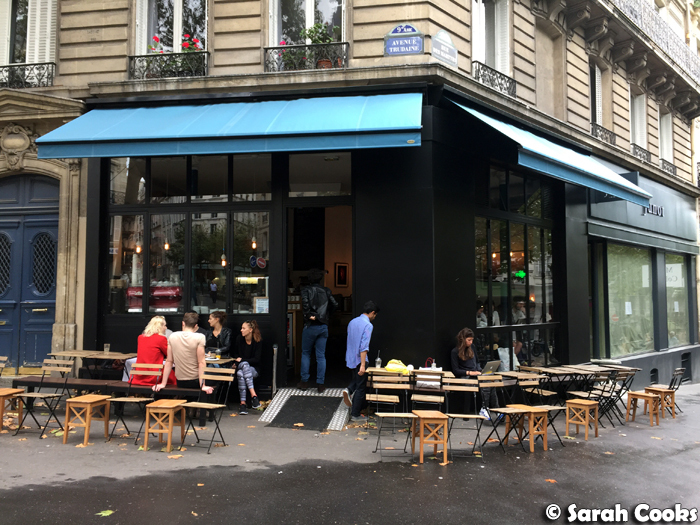 First up was Ten Belles (10 Rue de la Grange aux Belles, 75010 Paris), a mere ten minute walk from the Gare de l'Est (East Station). 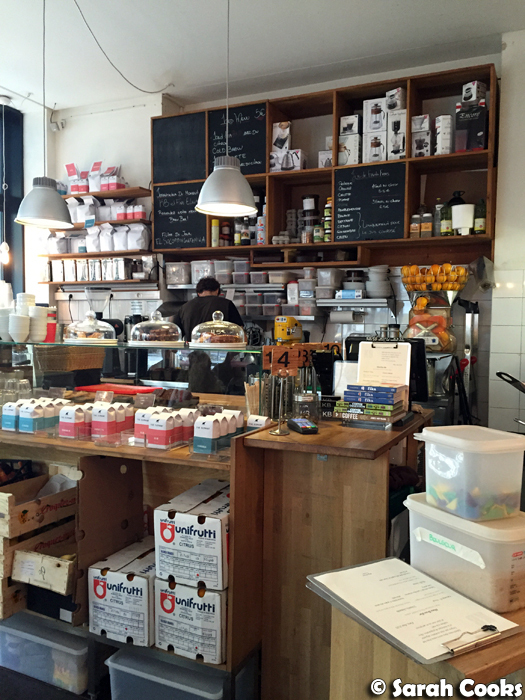 Ten Belles is a tiny little cafe that feels very Melbourne, and I'm pleased to say the coffee was delicious! 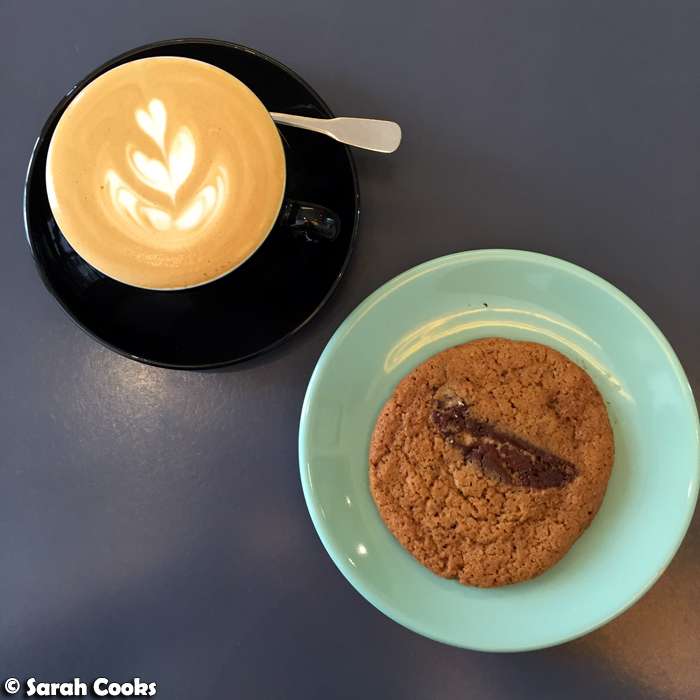 I had a great cappuccino and an excellent chocolate chip cookie, which had an addictive little pop of salt in it. Def recommend this place! These guys make juices, sell coffee beans to take home, as well as brunches, house baked cakes and all manner of coffees. I asked how they made their piccolos - double ristretto shot with steamed milk in a short glass. 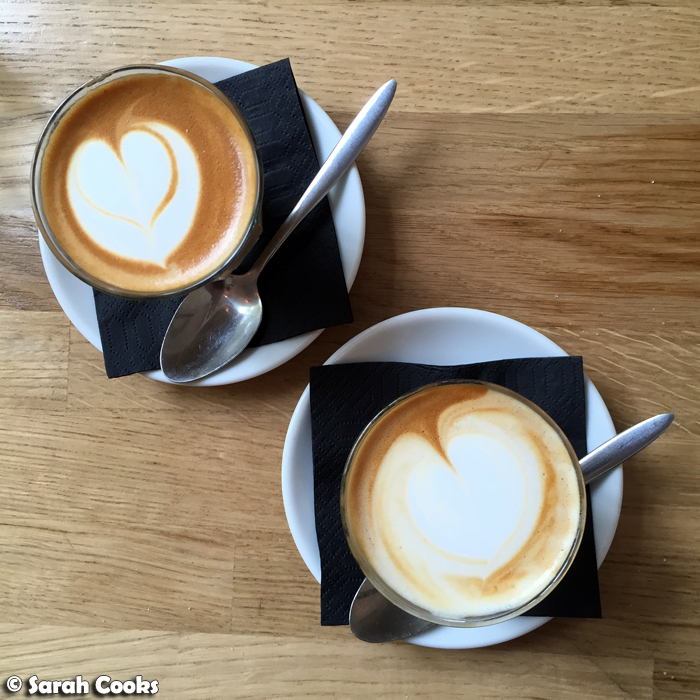 Just like my beloved magics (double ristretto three quarter flat white), which I'd been seriously missing whilst in Europe. 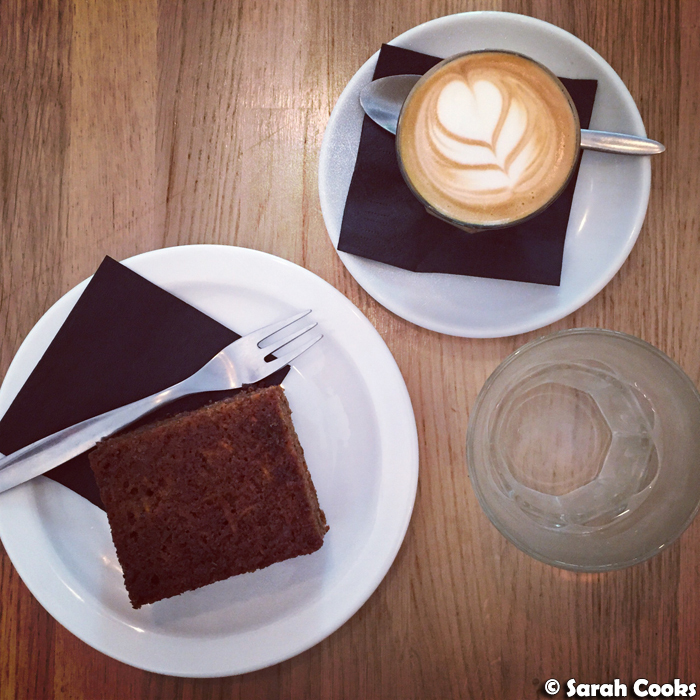 I practically inhaled the delicious piccolo, and also gracefully enjoyed a piece of moist and spicy carrot cake. And from here I went to meet Clarice, yay! We knew that we'd both be quite tired (me from the travel, Clarice from a full day of work), so rather than hitting the town, we decided to have a picnic dinner at her place! 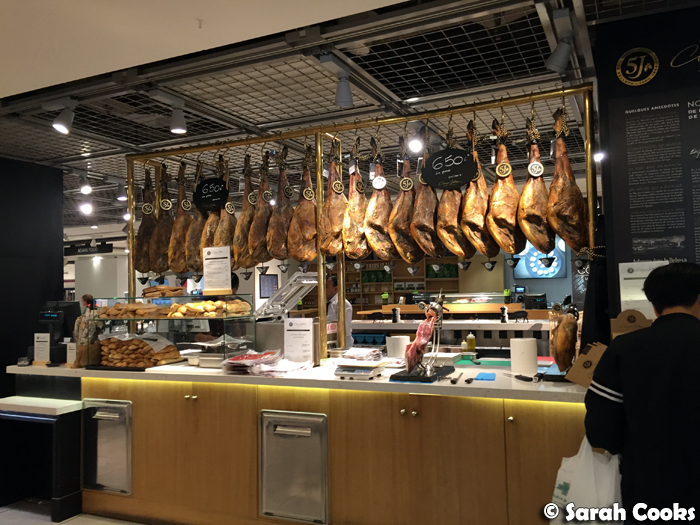 We bought a whole lotta goodies from the newly renovated Lafayette Gourmet, in the Galeries Lafayette department store (40 Boulevard Haussmann, 75009 Paris). 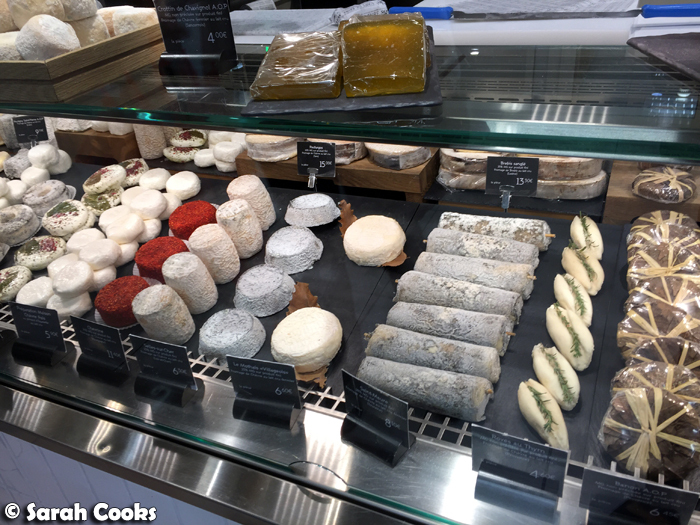 The cheese counters there are ridiculous! Love! Dinner that night was a piece of brie, Comté, a circle of Selles-sur-Cher (raw-milk goats cheese), some grapes, some baguette, and a rilette de canard with piment d'espelette (duck rilette with basque espelette pepper). And a bottle of Chablis. Delicious! 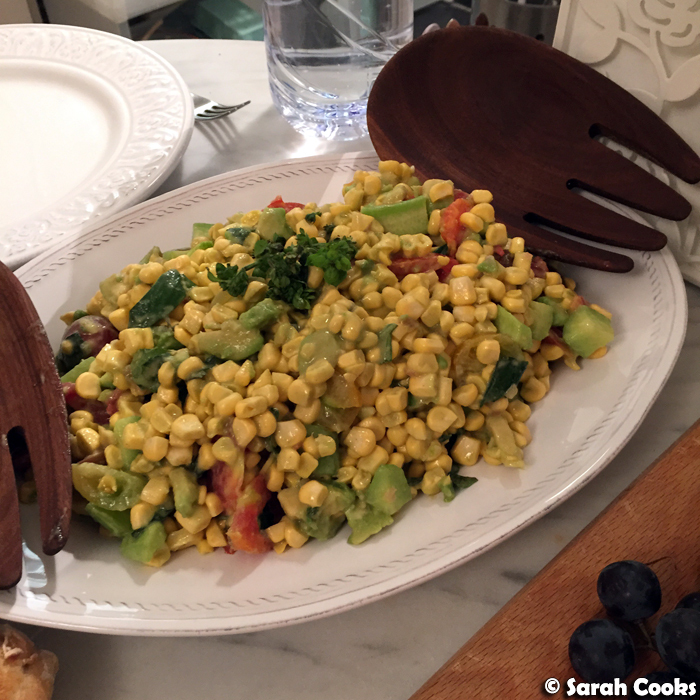 Clarice also made a wonderful salad - David Lebovitz' fresh corn, tomato, avocado and basil salad. Super fresh and crunchy! 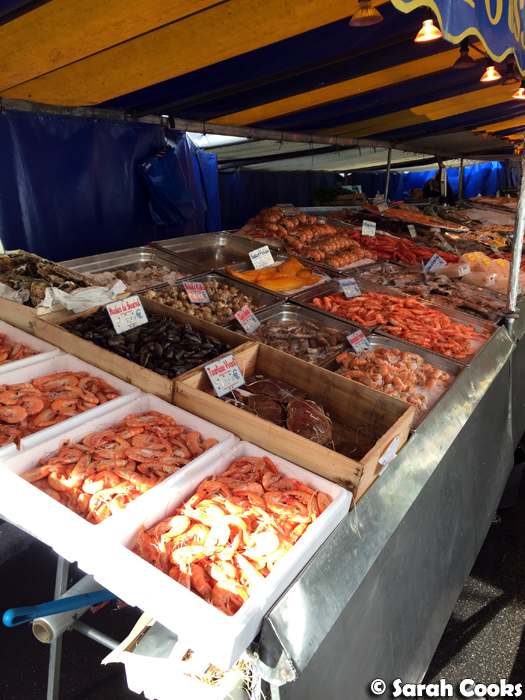 The next morning, we got up bright and early for a full day of food! 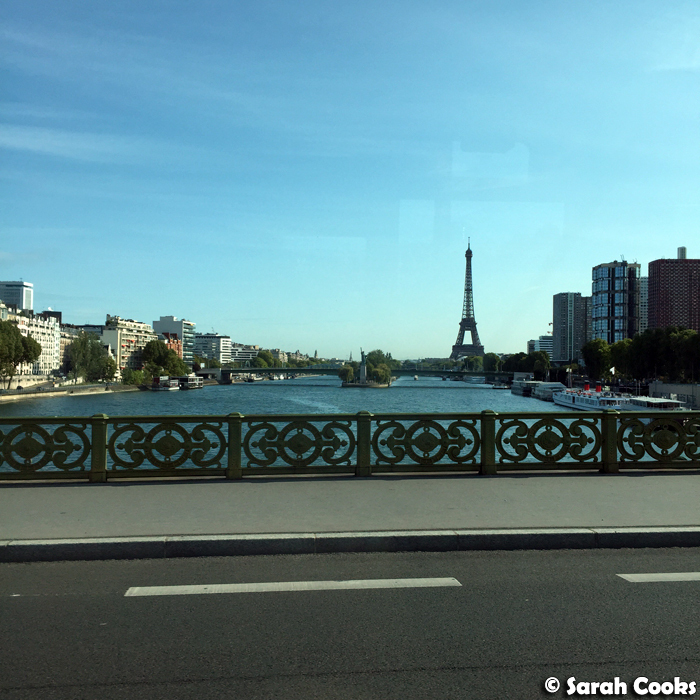 Having visited Paris a few times now, there weren't any touristy sites that I wanted to visit, but Clarice cleverly suggested we take buses everywhere, even though the metro is easier and faster, so that I could get to see the beautiful city as we travelled from place to place. Another bonus of having a local to guide me around! 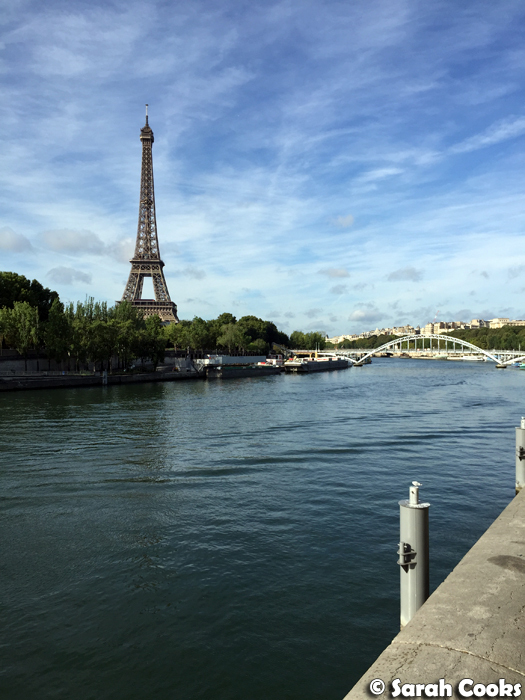 "Oh yes, there will be a view of the Eiffel Tower / Louvre / other spectacular monument coming up on your right". Hooray! 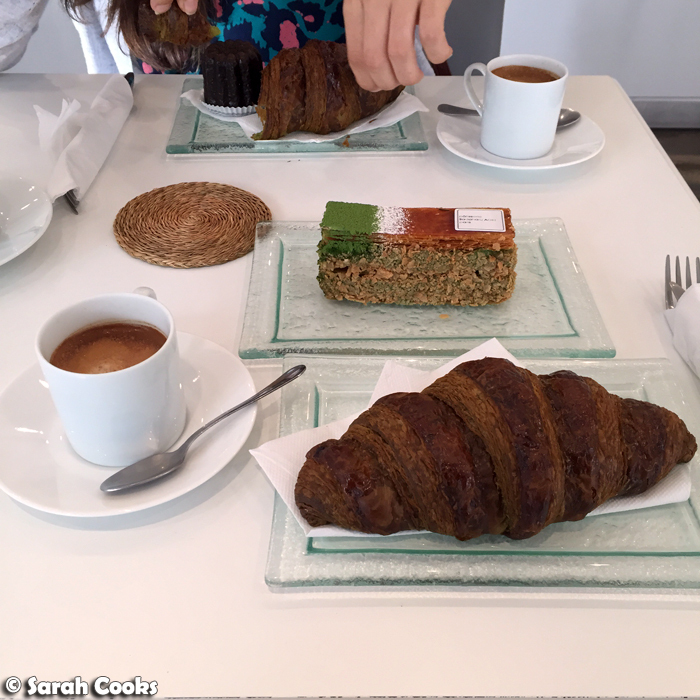 Breakfast was at my beloved Sadaharu Aoki (56 Boulevard de Port Royal, 75005 Paris). 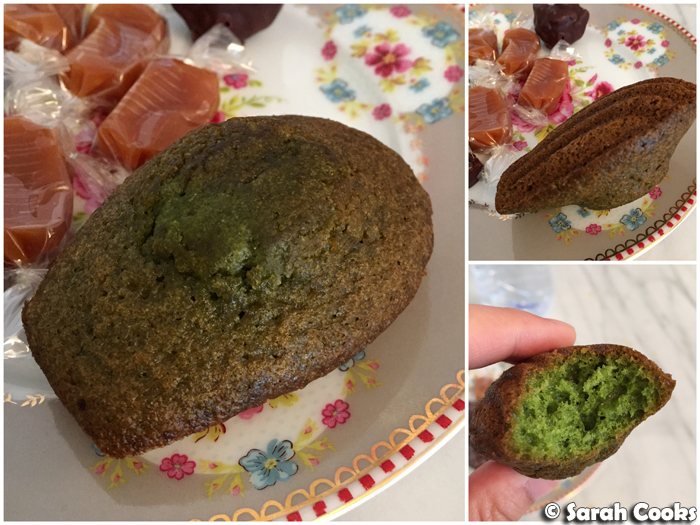 It was total matcha madness! 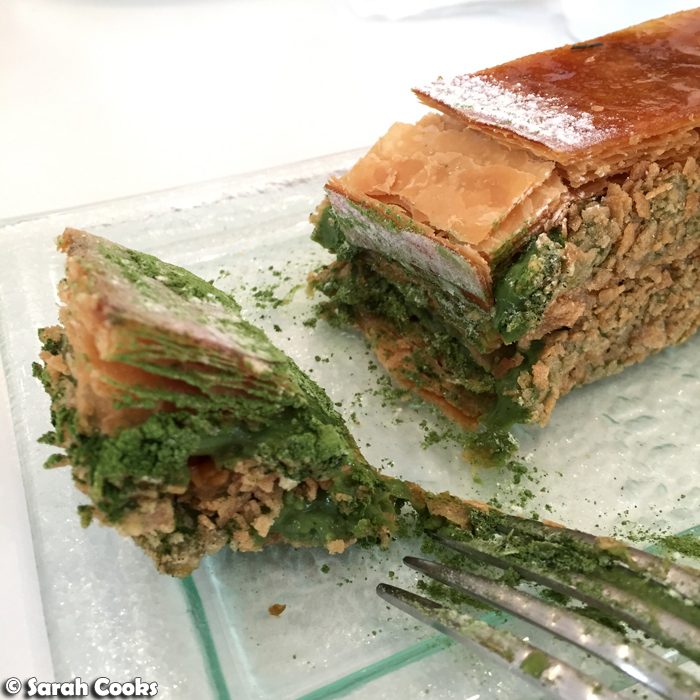 We each had a matcha croissant, and shared a matcha canelé and a matcha mille feuille. As well as an espresso each and a pot of genmaicha because matcha is not the only tea. I'm happy to report that it was just as lovely as I remember. (See my previous posts on Sadaharu Aoki, from 2011 and 2013). 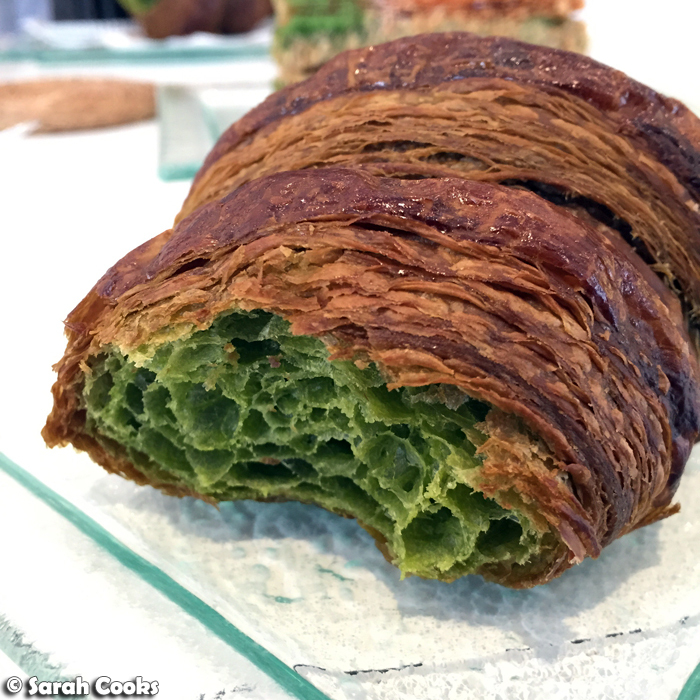 Sadaharu Aoki's matcha croissant is still one of my favourite things to eat. Look all that green flaky buttery goodness! 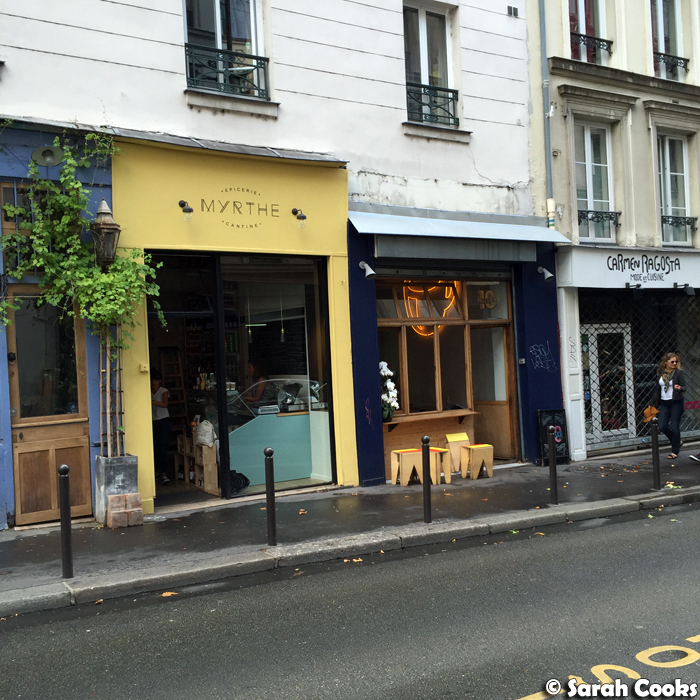 From Sadaharu Aoki, we took a bus to Pigalle and had a wander around the Pigalle and Montmartre area - lots of cute little shops here! They had a two course lunch for 19€, where you could choose an entree or dessert, and the main dish of the day. (Excellent value!) On this day it happened to be pork fillet mingon served with chanterelle mushroom sauce. Our neighbouring table ordered this, and it did indeed look delicious, but we were both craving beef so decided to treat ourselves and order à la carte. 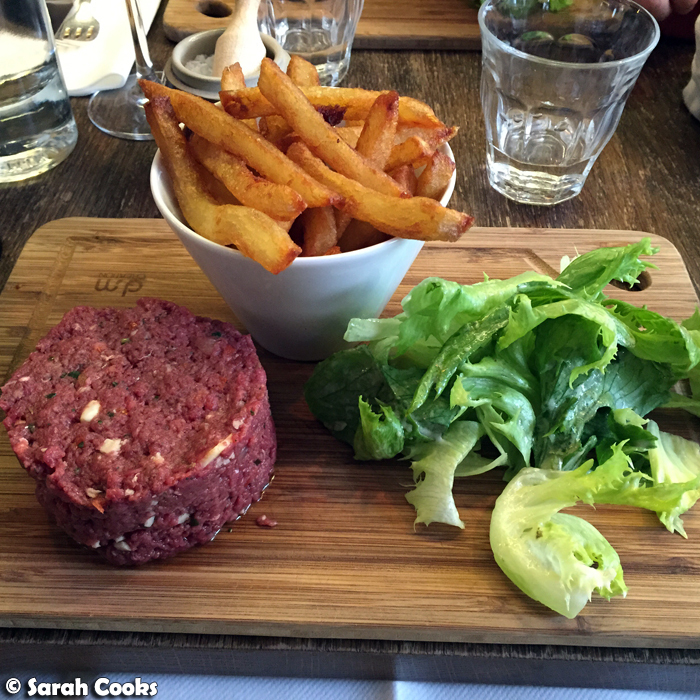 Clarice's steak tartare was just incredible! 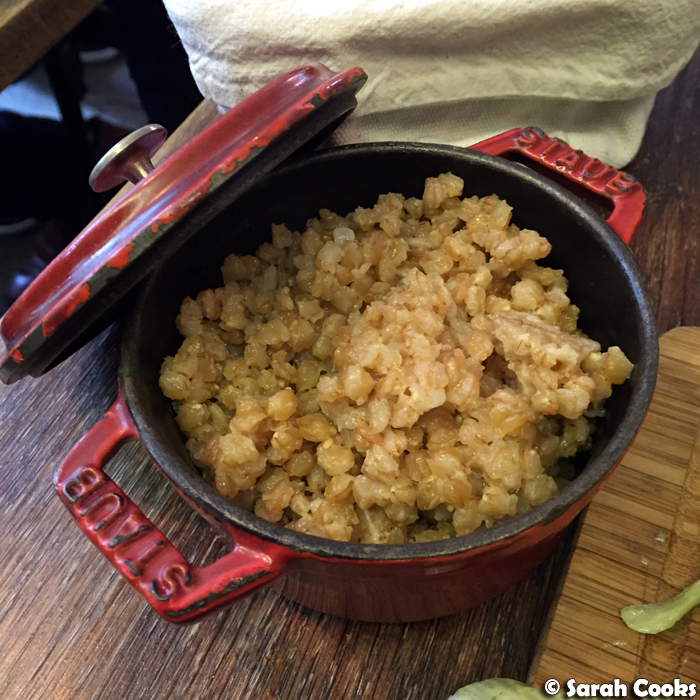 In addition to the usual mustard and capers, the tartare also included pine nuts and fine shavings of Parmesan cheese. The frites were also excellent, lovely and crispy on the outside, and almost creamy on the inside. 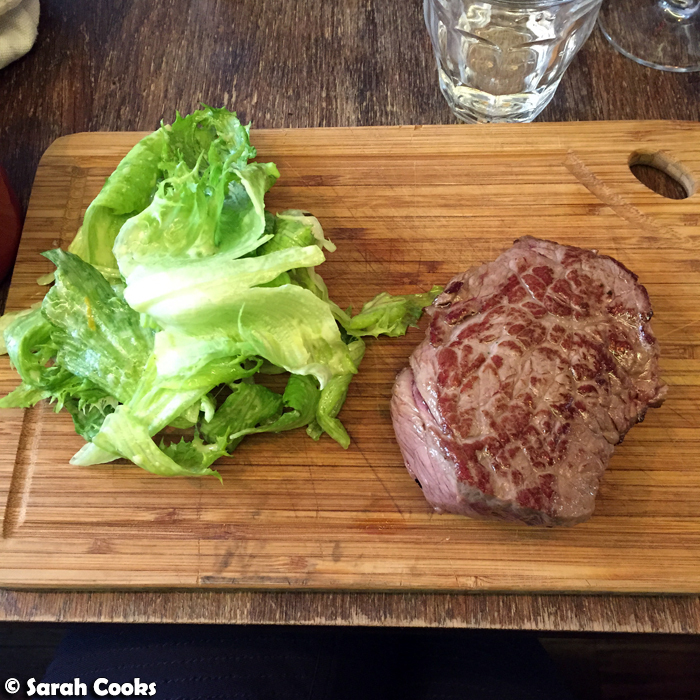 I ordered the steak polmard, which you could order either bleu or saignante (blue or bloody) - perfect for me! It was served simply with some salad leaves dressed in a mustardy vinaigrette. I also ordered a glass of wine on the side, a generous pour of Bourgogne. 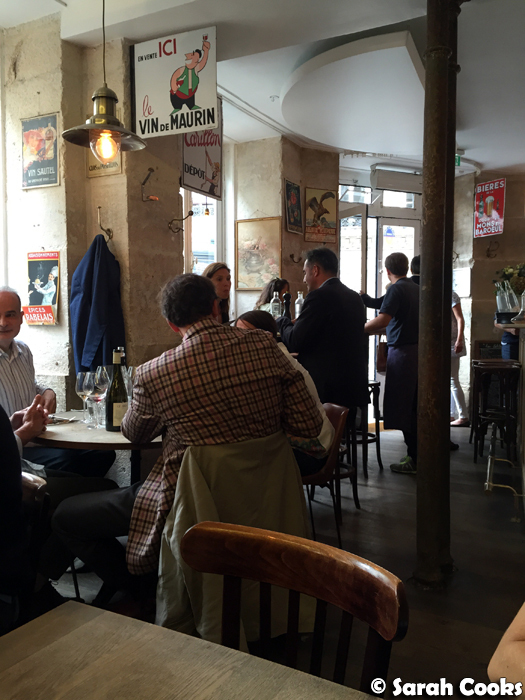 (I had no idea how to navigate the wine list, so just asked for a red wine, "un peu plus légère, s'il vous plaît"). 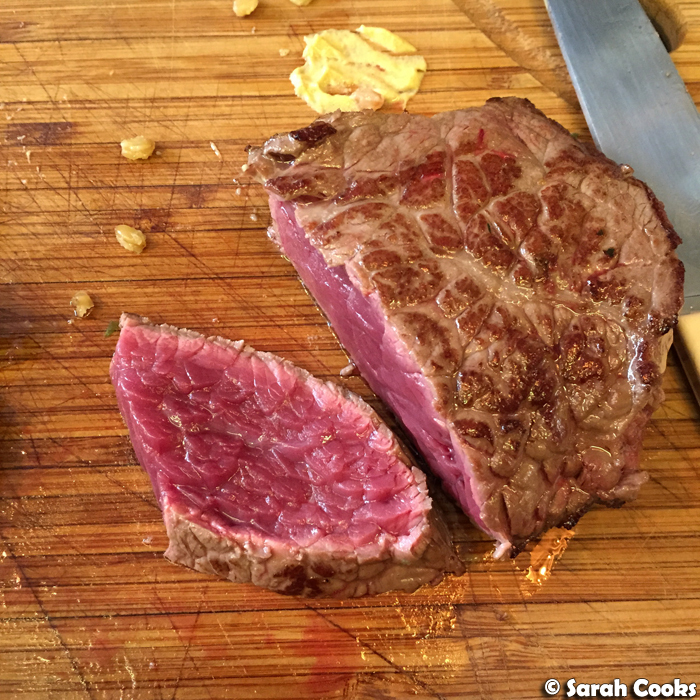 The steak was just gorgeous - incredibly soft and tender, and really flavourful. Since this lunch, I've learned that Polmard is a very small supplier with exacting standards, and you can certainly taste it in the finished product. Each main dish comes with an included side - there was the choice of frites, green beans, gratinated chard or buckwheat. As you can see, we ordered frites (of course), and chose the buckwheat as the second side. This was perfectly cooked, with a little bite to the grains, and was well seasoned. 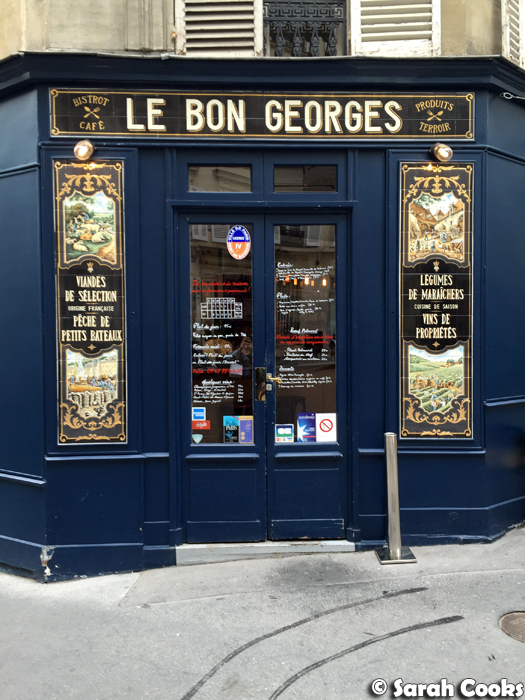 The lunch at Le Bon Georges was just fantastic, with excellent food, a cosy atmosphere and friendly, efficient service. I highly recommend it! From here, we took a long and slow walk across town to the Jacques Genin salon de thé. Google Maps tells me this was about a 40 minute walk, but it didn't feel that difficult because the weather was nice, we walked at a leisurely pace and were chatting the whole way. 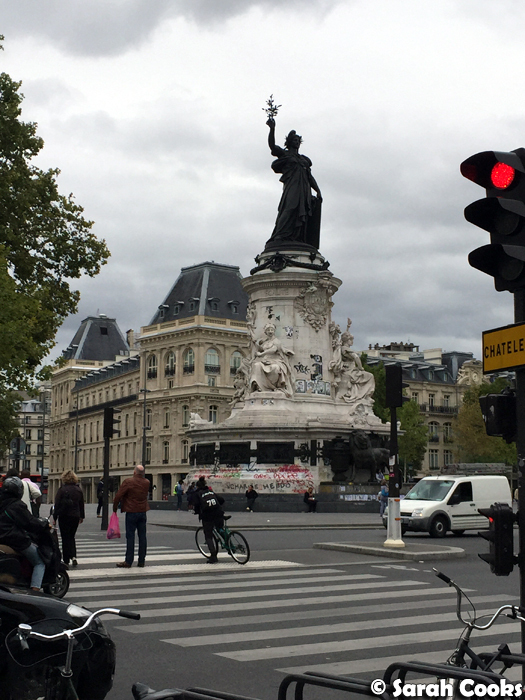 Clarice also pointed lots of cool sights out to me, like the Folies Bergère and the Place de la République - things that were cool to look at, but that I wouldn't necessarily have made a special trip to see, given the limited time frame. 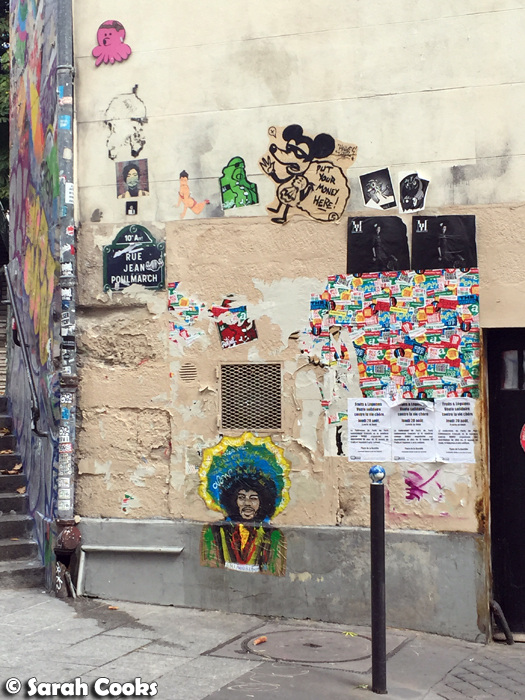 Jacques Genin (133 Rue de Turenne, 75003 Paris), on the other hand, definitely warranted a special visit. Clarice tells me there's often a queue for the limited seating there, but we lucked out and there wasn't a queue when we arrived. Chocolates and caramels are available to purchase, and there is a small menu of drinks and pastries for dining in, as well as specials, which change day to day. 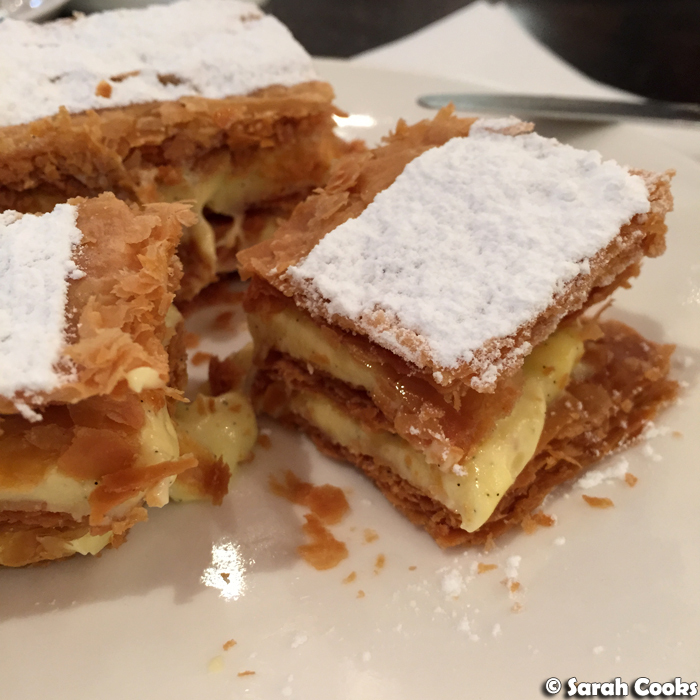 From memory, there was a lemon tart, a raspberry tart and a walnut and honey tart on offer that day, but I went for the classic hot chocolate and his famous mille feuille, which is assembled to order. 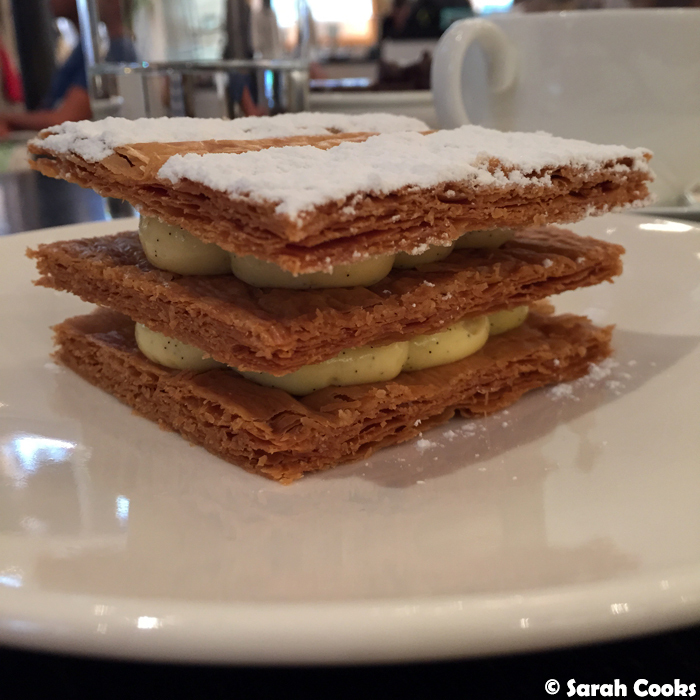 And with no disrespect to Sadaharu Aoki, this mille feuille was the best mille feuille I have ever had! 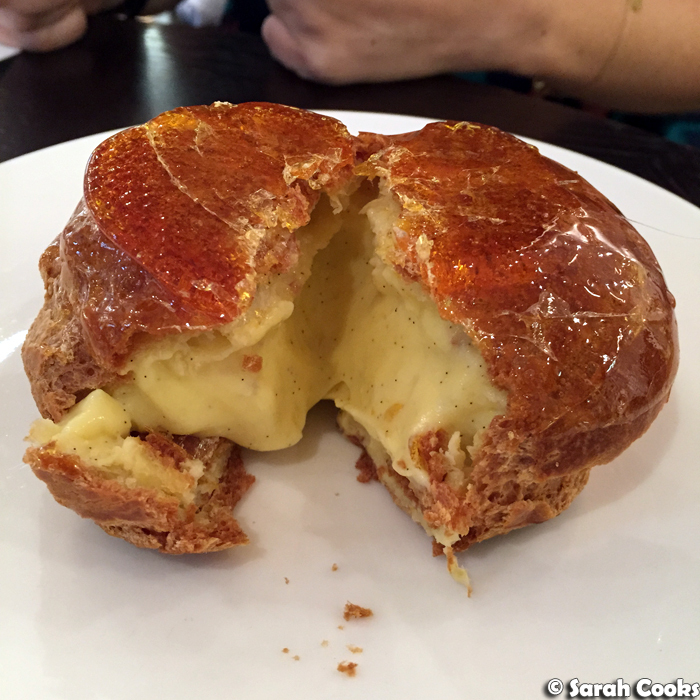 Incredibly flaky, buttery pastry and a gorgeous vanilla-flecked crème. 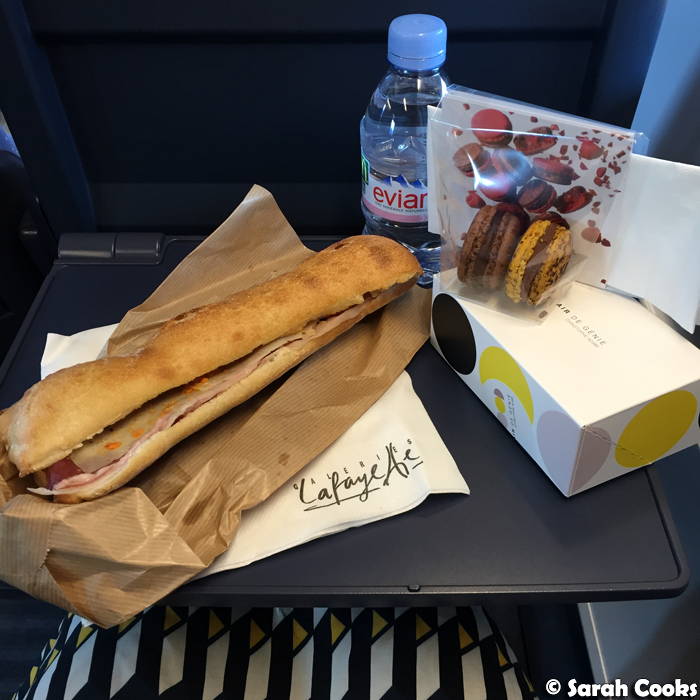 I'm already trying to plan my next trip to Paris so I can eat this again! 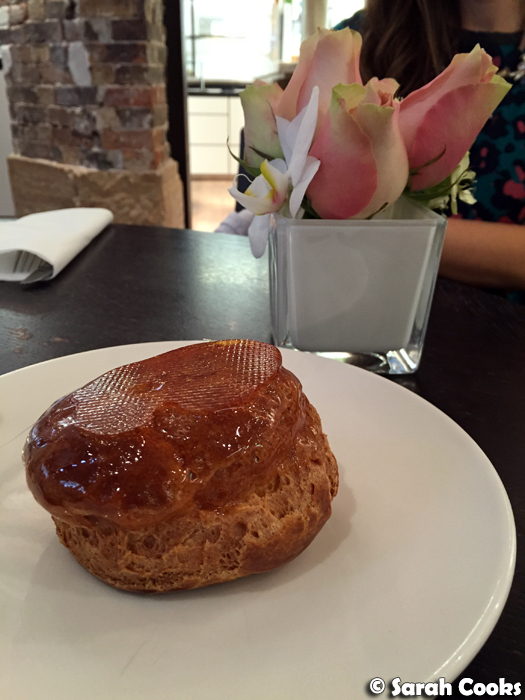 Clarice went for the chou à la crème - a classic choux puff filled with vanilla bean crème pâtissière, with a crackly caramelised sugar top. I don't need to tell you how good this was - just look at it! We were absolutely stuffed! 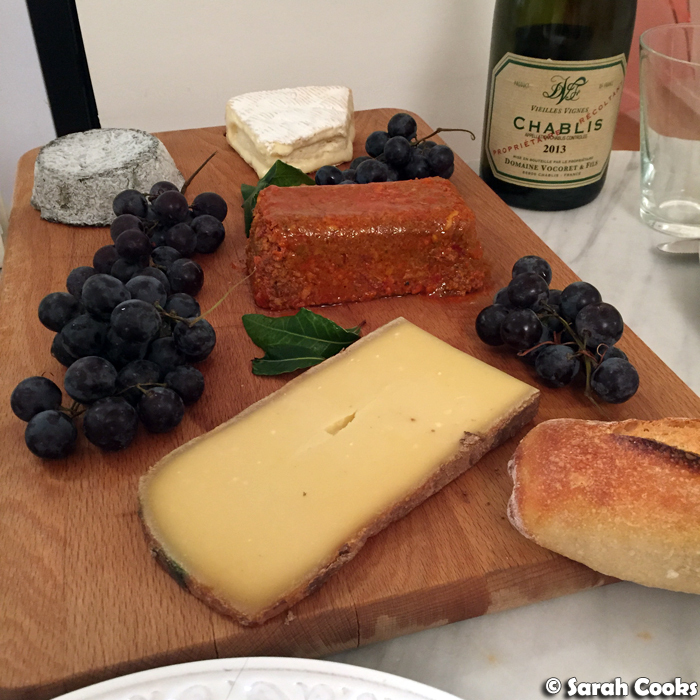 We then took a nice walk through the Marais and then went home to collapse, enjoy some more cheese and Chablis for dinner and watch a few episodes of Parks and Recreation. Yay! 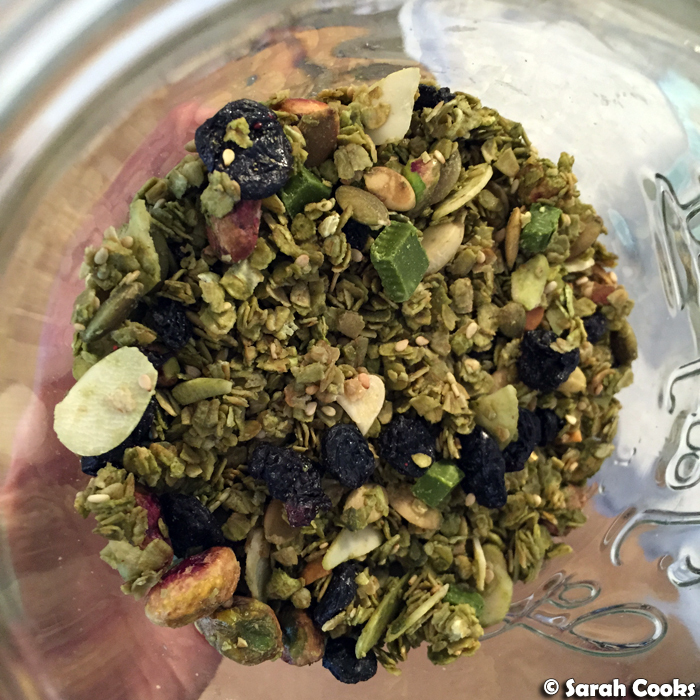 The next morning, we had a gorgeous breakfast at home, with some matcha granola that Clarice had made (the recipe is based on one from She Who Eats), which included dried blueberries, pistachios, pepitas and little flecks of matcha chocolate. Wonderful. 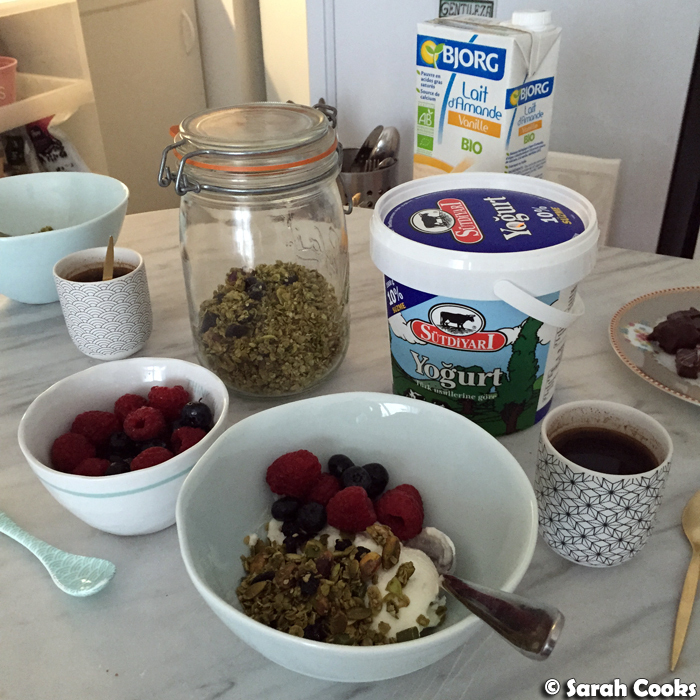 We ate the granola with thick Turkish yogurt, organic almond milk, some berries and little cups of strong and sweet Indonesian coffee. 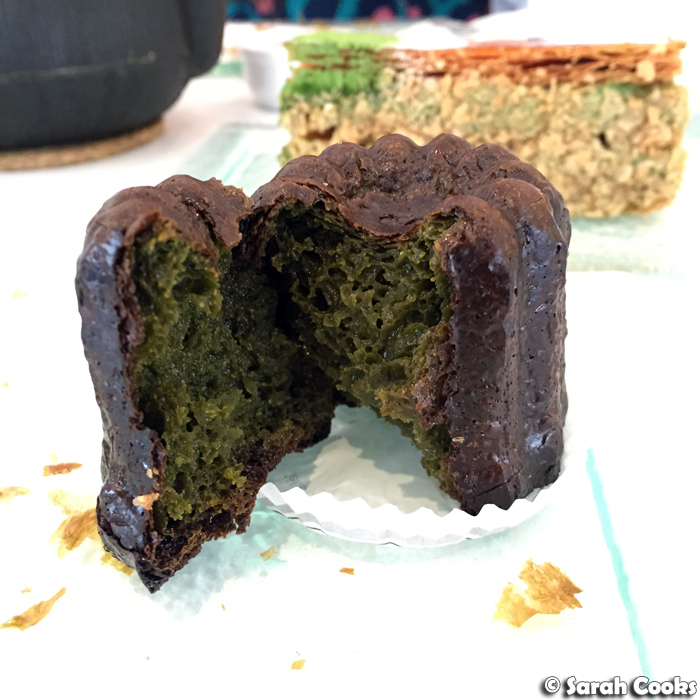 I actually picked up a tablette of matcha chocolate from Sadaharu Aoki while we were there, so I'm looking forward to making the matcha granola once I'm back in Melbourne! 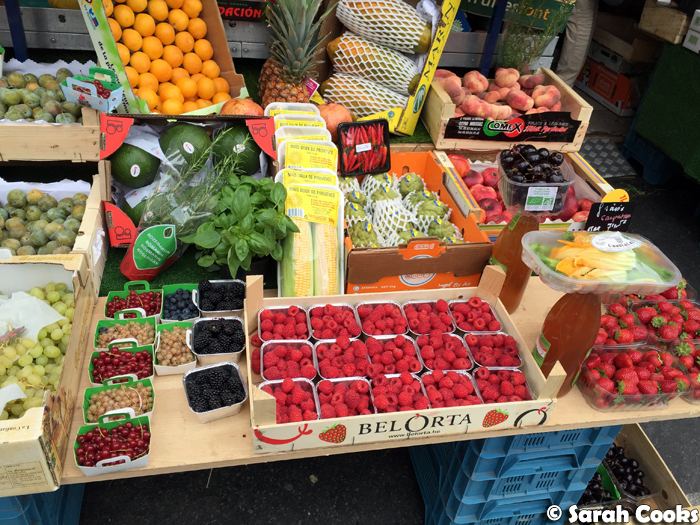 We took a walk through the Président Wilson Market (Avenue du Président Wilson, 75016 Paris), where Clarice bought some groceries and I got some gifts from the non food stores. 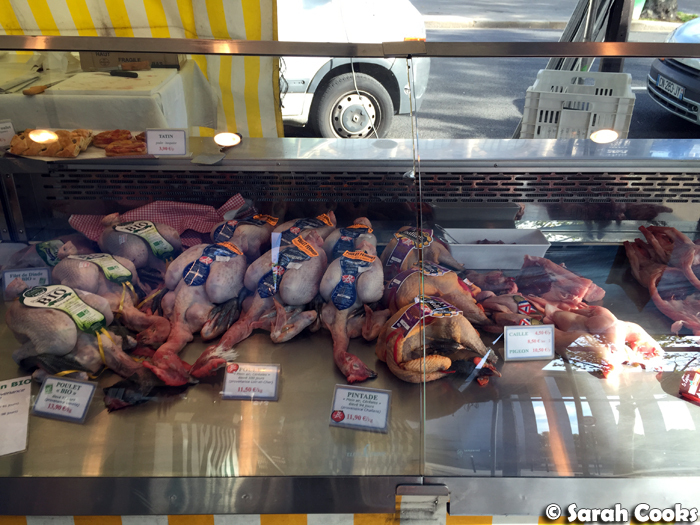 I find it interesting that the poultry are sold with heads, beaks and (sometimes) feathers, to show off their species. 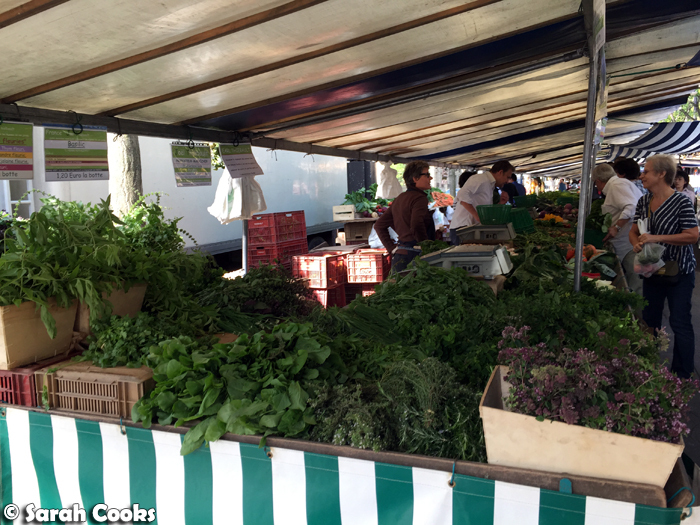 The Joël Thiébault fruit and vegetable stand is famous (indeed, they supply Le Bon Georges), and if you get to the market early, you can see Parisian chefs taking a coveted spot behind the counter, picking out the best produce for their restaurants, while regular customers line up at the front. 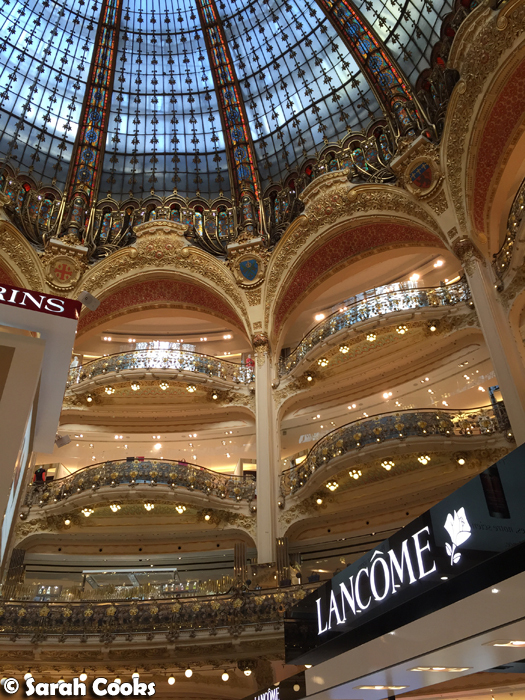 And from here we had just enough time to swing past Galeries Lafayette again, to stock up on last minute gifts (éclairs, macarons, chocolates), and get me some snacks from Lafayette Gourmet for the train ride home! The Bocata Ciabatta (7€) I bought contained Palette Ibérique race pure Bellota, as well as thin shavings of raw-milk Manchego cheese and tomato puree. Subsequent Googling has taught me that "Palette Ibérique race pure Bellota" means that the ham comes from the front legs of a pure Iberico pig "fed on a diet of acorns during the Montanera and granted DO status. These hams are aged for at least three years before being released and often labelled 'reserva' and 'gran reserva' to denote their age". (Source: The Guardian). It was... literally... one of the best things I have ever eaten! 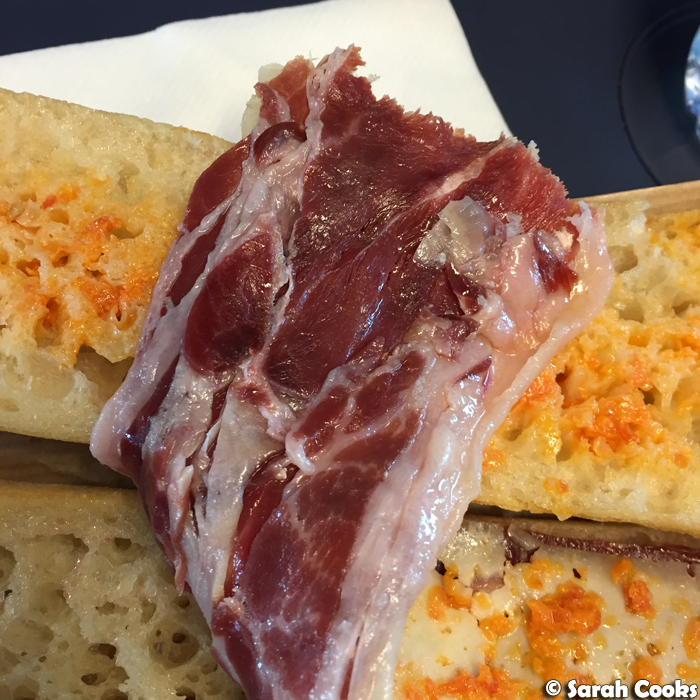 The ham was so soft and a little sweet, combined with the sharp manchego and the tomato purée, and a drizzle of excellent extra virgin olive oil - I savoured every mouthful! 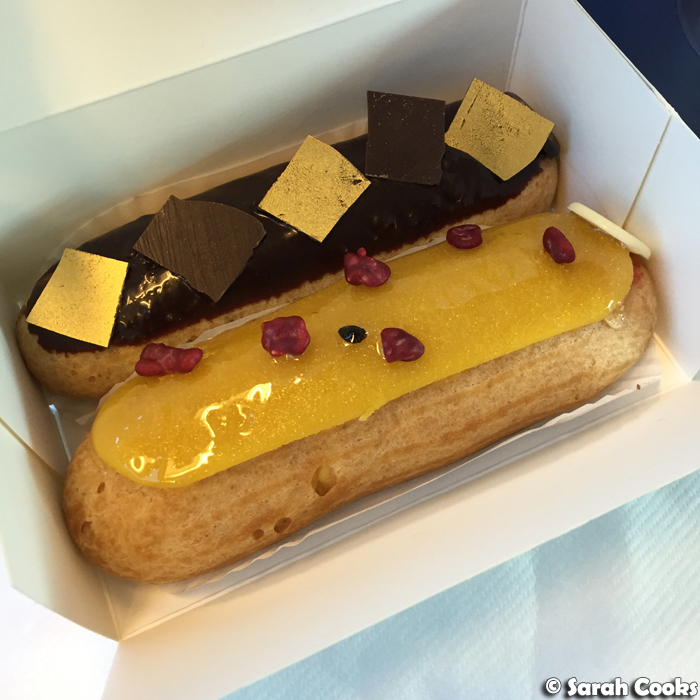 Sandra's mum had asked me to bring her an éclair back to Germany, which I ended up getting from the L'éclair de Génie outlet at Lafayette Gourmet. I got her a chocolate éclair, and with some gentle prodding from Clarice (it didn't take much convincing), I bought myself a passionfruit and raspberry one for the train ride. So good! I loved the addition of crispy raspberry pieces on top as well. Of course, I just had to buy myself some of my favourite Pierre Hermé macarons, which Sandra and I have been savouring ever since I got back to Germany. 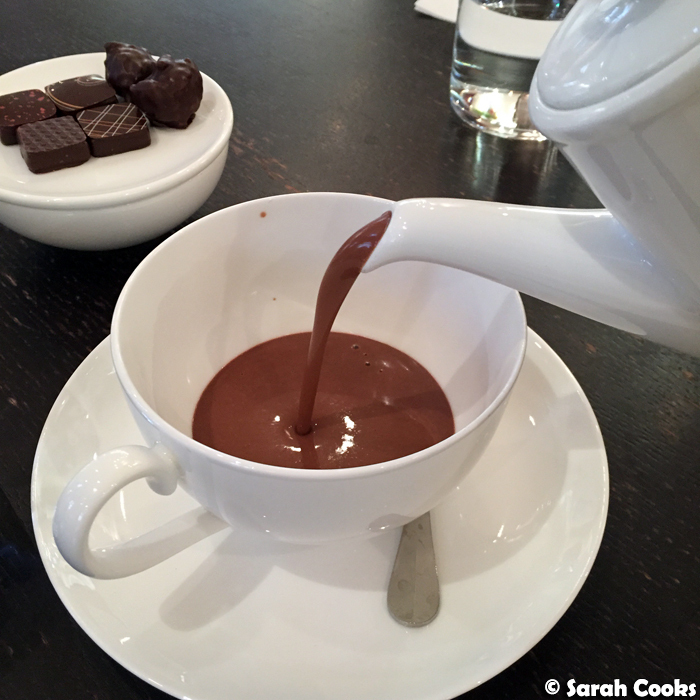 Mogador (chocolate and passionfruit) for the win! Big thanks to Clarice for a super-fun, food-filled couple of days! 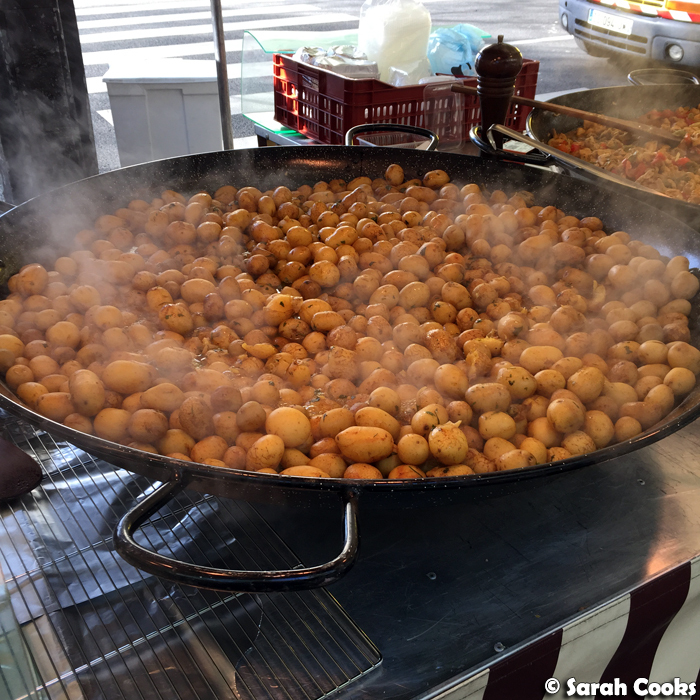 Anyone with foodie recommendations for Paris, please hit me up in the comments! Hopefully I'll be able to make another trip sooner rather than later! And! You can also read about mine and Clarice's previous holiday through Europe in the "Europe 2006" label. Oh the cheese!! How divine. I would have spent hours at that counter deciding what to buy. And Paris is looking as gorgeous as ever.